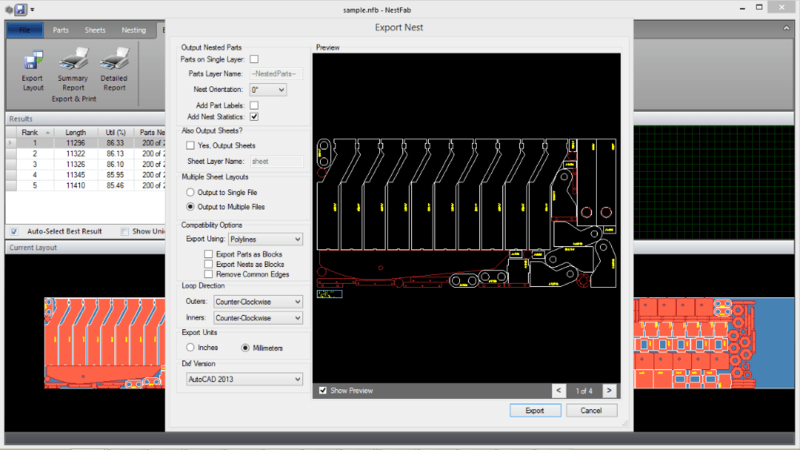 Export nested layouts for your controller or CNC software. Powerful nesting technology that saves time and plate. 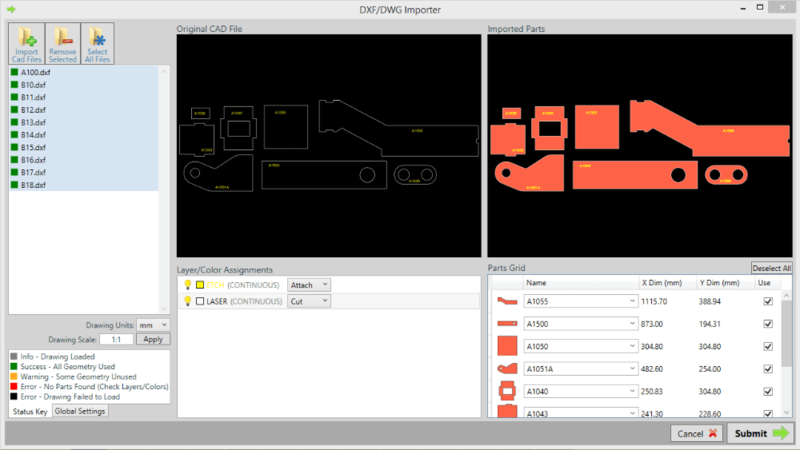 Import drawings with our quick and easy import wizard. Generate full nest reports for your production team. Introducing NestFab, the world’s most effective automatic nesting software. Reducing preparation time, material consumption and most importantly, saving you money – NestFab is a simple to use, extremely effective nesting product that uses industry standard CAD formats, to easily slot into any tool chain and workflow. 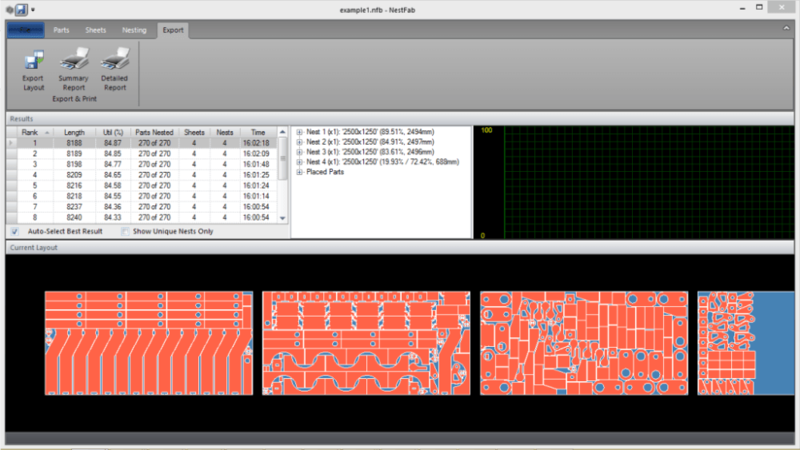 NestFab Automatic Nesting Software has uses across many applications and industries, including: Sheet Metal and Composites. About three years ago we began looking for nesting software to maximize nesting efficiencies and help reduce our raw material costs. We worked with several software companies, trying out various demo software and even having some on-site software demonstrations. It quickly became clear that NestFab had the best user interface, the best CAD importer, and the best nesting performance. Efficient Software were the only company that would actually talk with us, listen to us, and understand our software needs. NestFab is ideal for our needs and the tool is of great value. Nestfab ensures that we, as a shipyard, bear the costs in hand regarding the cutting of the steel. Where we previously had to outsource the nesting of all the metal parts of a yacht which can be around 160 tons of steel, and thus lost control, we have it now again completely in our own hands. Sometimes in smaller projects, we get the cutting files in the tendering stage. So we can also use nestfab to calculate the cutting costs in advance. An affordable program that has already been repaid several times. We tested and compared several nesting software solutions before choosing NestFab. Some were cheaper, others were much more expensive but, in our case, NestFab was the option with the best performance. With NestFab our company has saved a lot of money from even the first day’s usage. Nestfab helps me save a lot of time and money. Our files are nested quickly so our production line is faster as well. We have saved a lot of money compared to the price of the software. I highly recommend NestFab to anyone looking for a powerful nesting software. The Nestfab software is user friendly and has saved our company a lot of time, as well as helping to reduce our material waste. The customer service and support staff have always been helpful, friendly and prompt to respond to any questions or concerns. This software is a great investment to our company. We have continuously benefitted from the ‘no strings’ perpetual licence, excellent efficiencies, fantastic support and ongoing improvements. NestFab has a performance to rival all other nesting software and does so at a competitive price. A good investment in software, saving us around a 5 hours per week in labour and also a good saving in reduced material waste. Using Nestfab to automate the nesting of our sail panels prior to cutting has saved us countless hours and thousands of pounds in material wastage costs. The guys at Efficient software always listen to our suggestions and are constantly improving the functionality and efficiency of the software as a result. Nestfab has paid for itself several times over. We are very satisfied with the improved performance in comparison to MyNesting. We are rapidly approaching the busiest time of the year for our company and because of that we are especially happy about every sheet that we can save due to improved nesting performance. Our customers use NestFab along with our CNC knife machines to optimize a wide variety of materials and applications. It’s simple to use, easy to integrate, and extremely flexible. We have customers in the glass industry seeing 15-30% material savings. We have customers cutting Carbon Fiber, a very expensive material, and NestFab pays for itself in days, not months. We have sailmakers who use NestFab to turn a very time consuming task of manual nesting into one that takes only seconds. 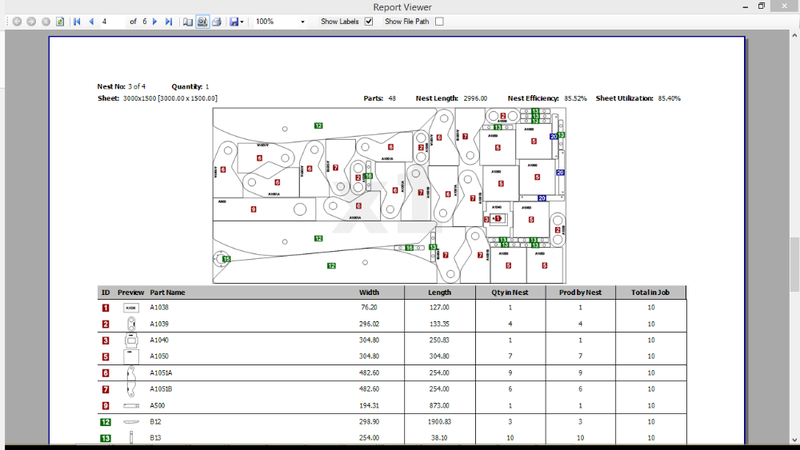 NestFab has a very clean user interface, is intuitive to operate, generates thorough nesting reports, and is constantly improving. If you spend more than one or two hours per week nesting, then NestFab is a one year ROI and a no-brainer. See why businesses and individuals are turning to NestFab for all their automatic nesting needs. Multiple seat discounts available – contact us for more information. Download your 7 day free trial to see the application in action today!